The New York Mets have signed former NFL quarterback Tim Tebow to a minor-league contract, the team announced on Thursday. Tebow worked out for 28 out the 30 MLB teams during a showcase on Aug. 30, showing impressive power, running the 60-yard dash and doing outfield drills. He hasn't played organized baseball since his junior year in high school. The Heisman Trophy winner spent six seasons on various NFL rosters, although he hadn't appeared in an NFL regular season game since 2012 when he was a member of the New York Jets. 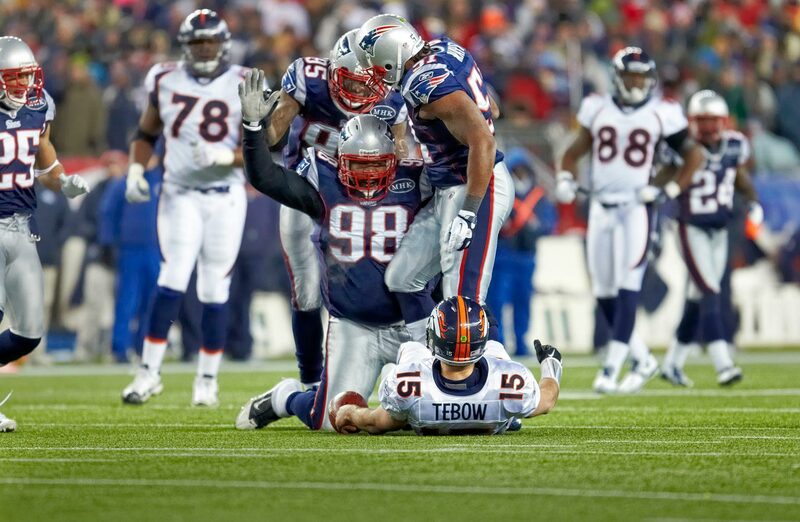 Here are some classic "Tebow Time" photos. Tim Tebow poses during the second day of the EA Elite 11 quarterback camp. Coming out of high school, he was the 22nd ranked recruit at any position, according to Rivals.com. Tim Tebow is coached by Tyler Palco during the third day of the EA Elite 11 quarterback camp. Tim Tebow plays catch at the beach during the EA Elite 11 quarterback camp. He was the top-ranked high school quarterback, according to Rivals.com. Tim Tebow walks with Josh Freeman, Pat Devlin, Neil Caudle, Jevan Snead and Matthew Stafford during quarterback camp. 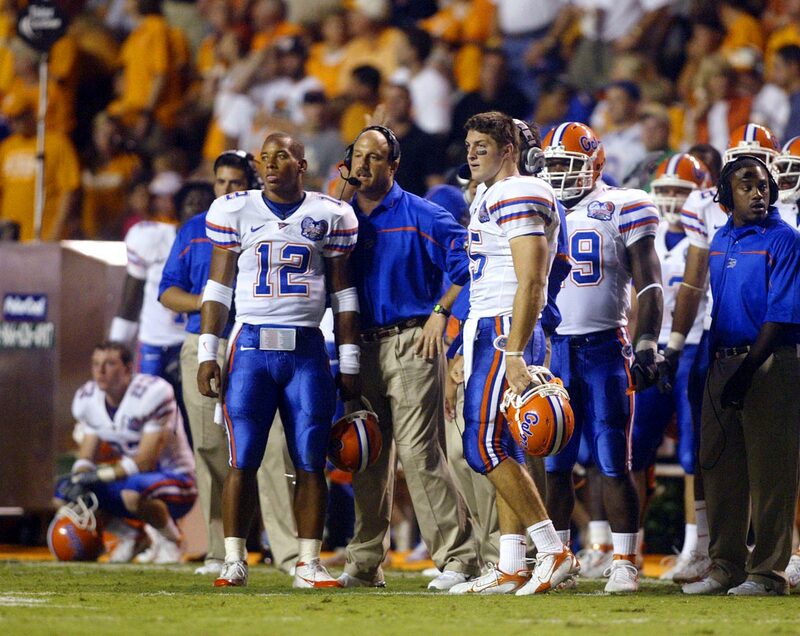 Tim Tebow and Chris Leak look on during a game against Tennessee. 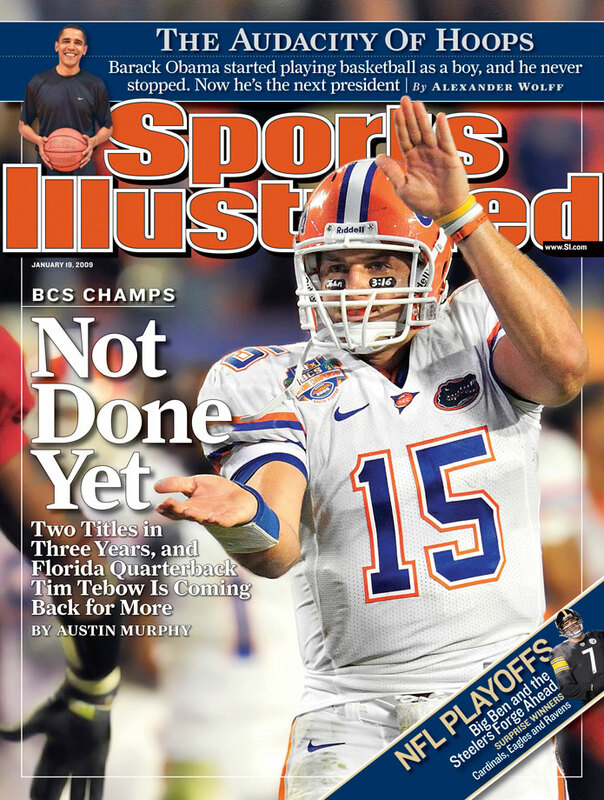 The quarterbacks would split time during Tebow's freshman year and go on to win a BCS national title. 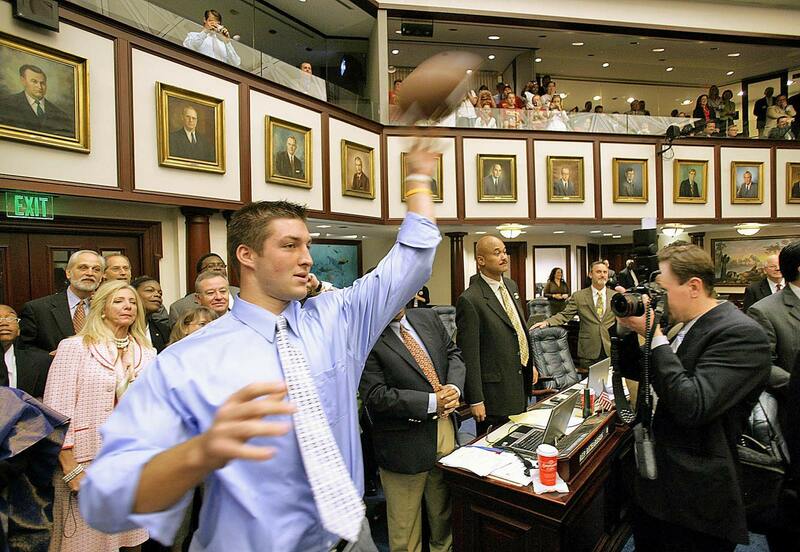 Tim Tebow throws a pass to Marco Rubio, Speaker of the Florida House of Represenatives, in the house chamber at the Capitol in Tallahassee, Fla. Tebow was honored at the Florida State Capitol after he won the Heisman trophy and was part of Florida's national championship team. Tim Tebow poses with teammates Brandon Spikes and Percy Harvin during an SI college football preview photo shoot. All three were later drafted by NFL teams. 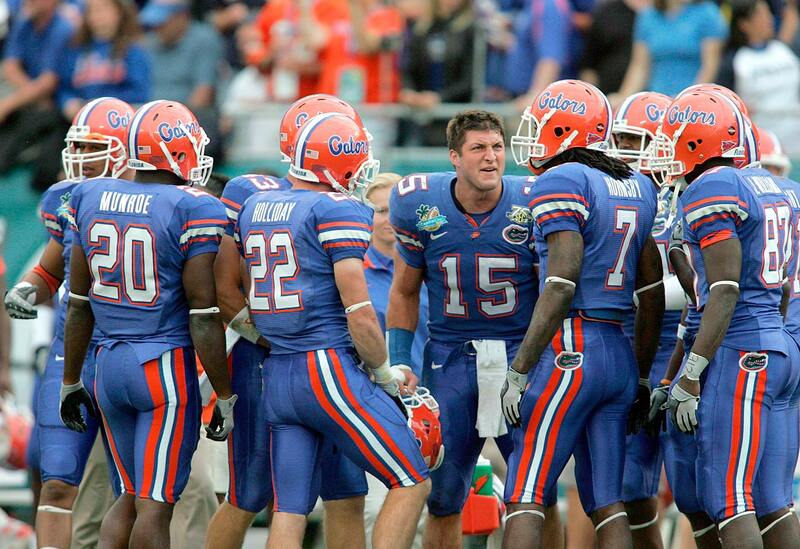 Tim Tebow attempts to motivate his team during their Capitol One Bowl game. Florida lost 41-35 to Michigan. 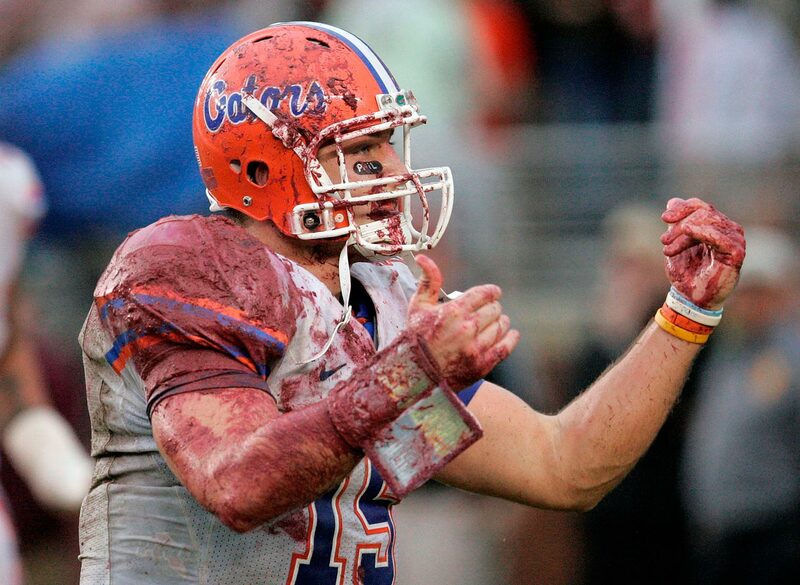 Tim Tebow displays his "Christian Warrior" image during a muddy game against Florida State in Tallahassee, Fla. 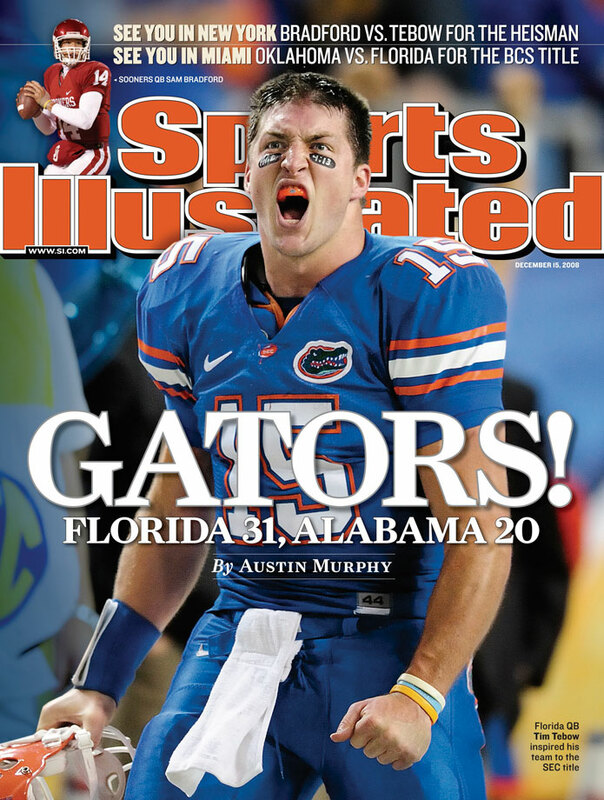 The Gators would win 45-15. 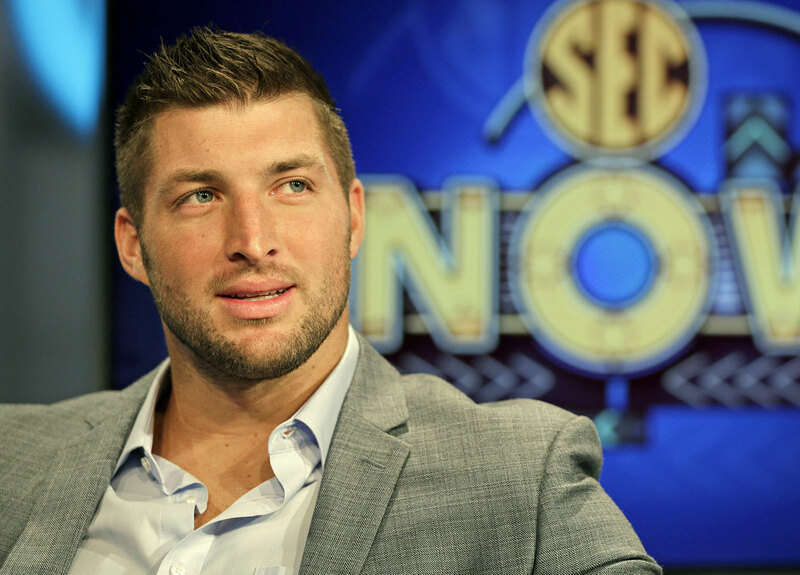 Following Florida's loss to Mississippi, Tim Tebow made this statement to the media. 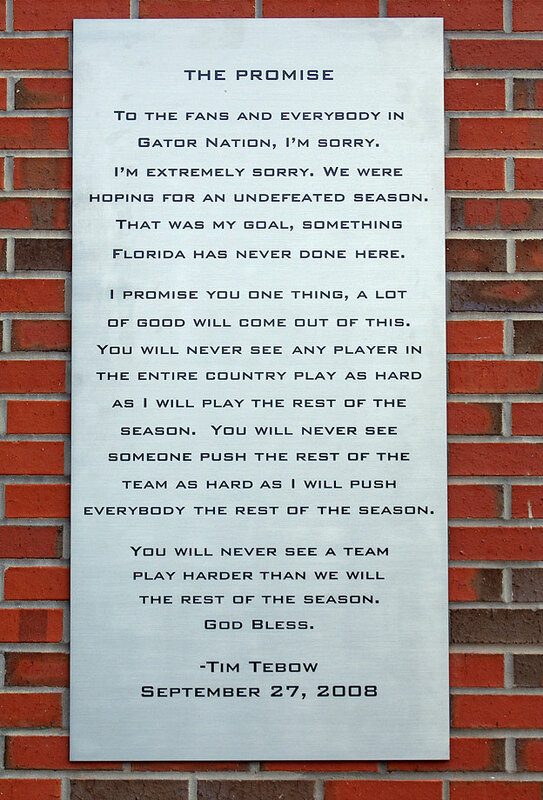 The Gators' put the inspirational words on a plaque outside the football offices and went on to win the 2009 national championship. Tim Tebow and his teammates celebrate a victory over Alabama in the SEC Championship game. 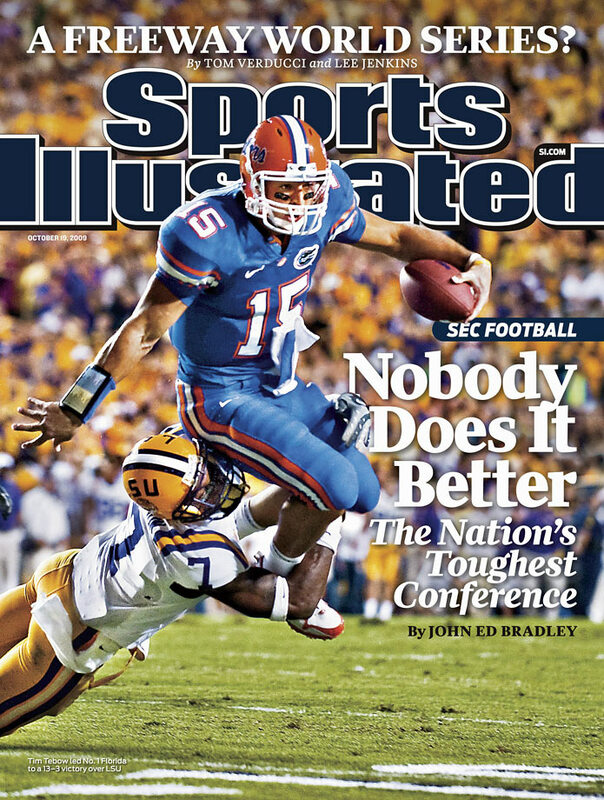 Tebow's Gators won SEC Championships in 2006 and 2008. 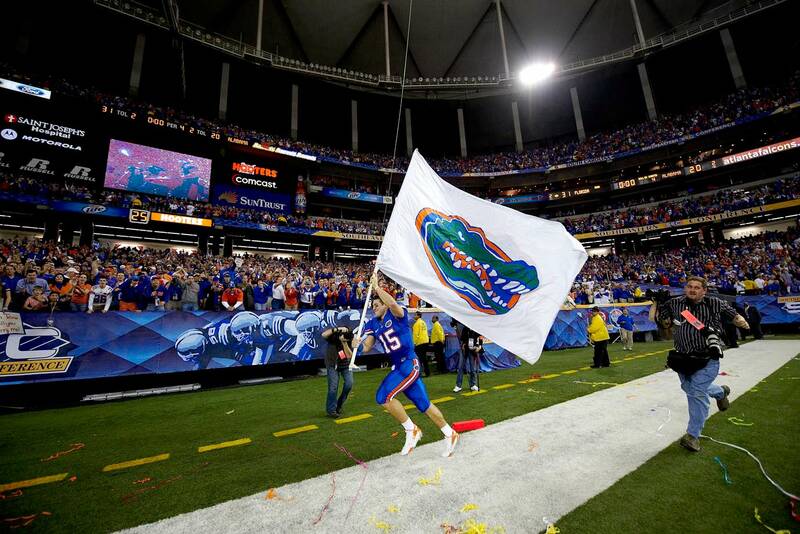 Tim Tebow steals some playing time from the Gator mascot during Florida's SEC Championship game victory over Alabama at the Georgia Dome. Tim Tebow holds the Disney Spirit Award and the Maxwell Award, given to the nation's best all-around player. 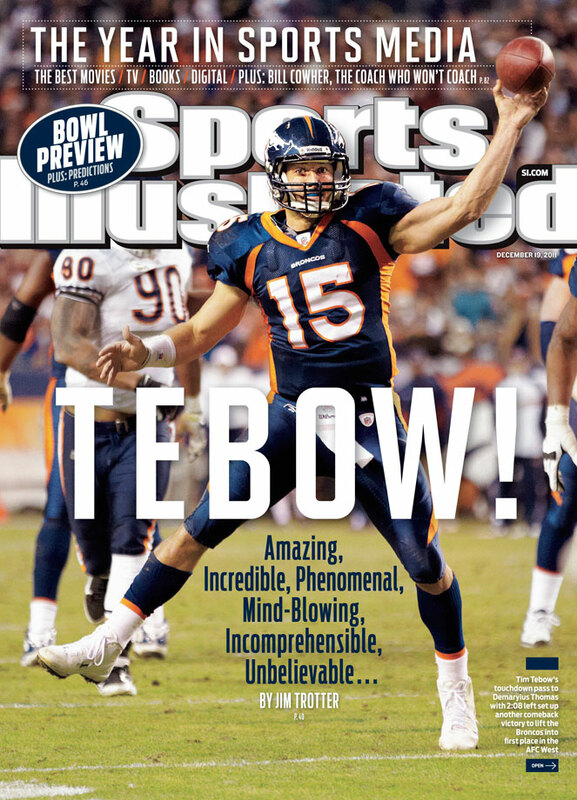 Tebow finished 2008 with 2,746 passing yards 42 total touchdowns. Tim Tebow taunts Oklahoma's Nic Harris with a Gator chomp during the BCS National Championship. Tebow received 15-yard unsportsman penalty for the gesture. 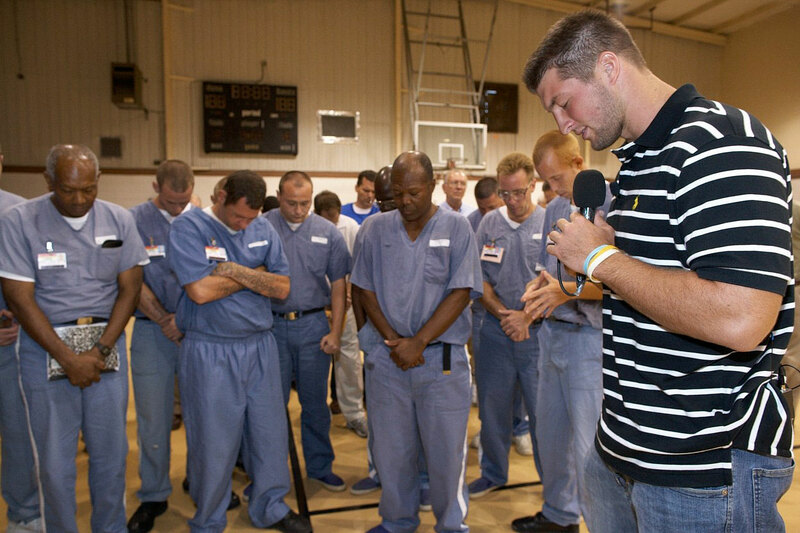 Tim Tebow prays with inmates at Lawtey Correctional Institution. Tebow and former NFL head coach Tony Dungy often share their faith in America's prisons. With two national championships and a Heisman trophy to his name, the Florida Gators’ quarterback long ago secured his legacy as one of college football’s all-time greats. 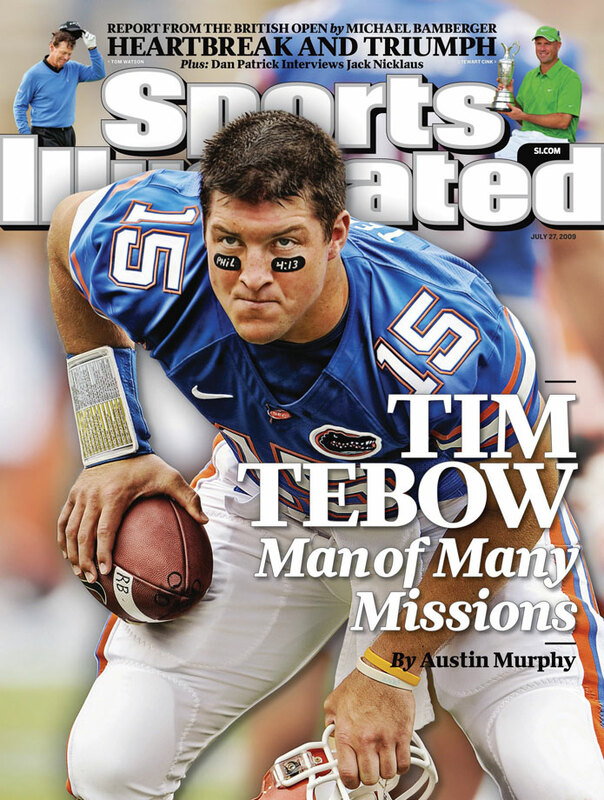 It is off the field, living a life devoted to Christian humanitarianism, where Tebow continues to make his mark. Tim Tebow attempts to break a tackle by Patrick Peterson during a Florida-LSU game in Baton Rouge, La. Tim Tebow had his critics on high alert as rumors of his presence in a pro-life commercial swirled before Super Bowl XLIV. In reality, the ad, which starred Tebow and his mother plugging a website called "Focus on the Family," turned out to be much tamer than the fervor preceding its airing, which included some groups demanding that CBS not run it. 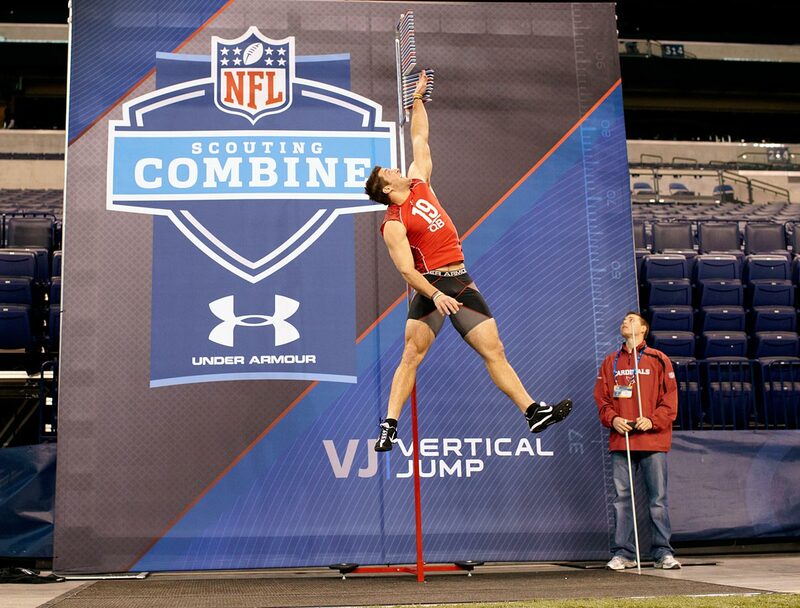 Tim Tebow has his vertical leap tested during the NFL Combine workouts. He was selected with the 25th pick in the first round. 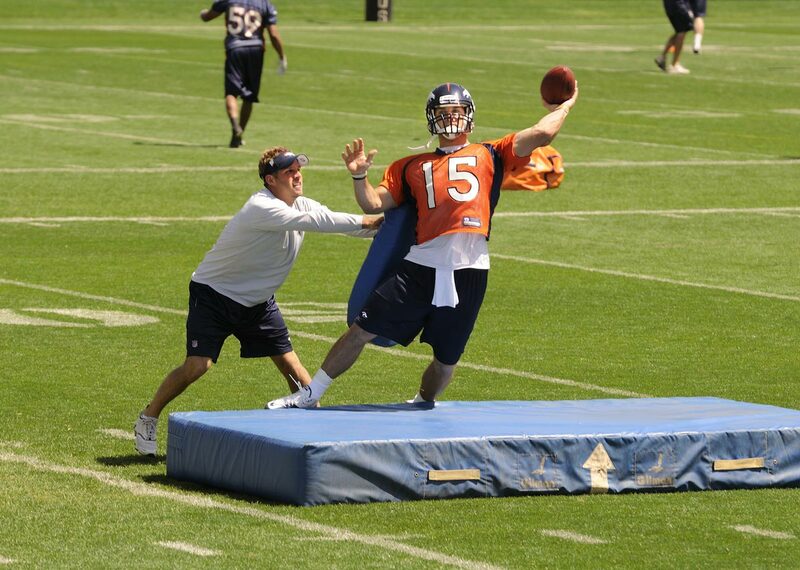 Broncos quarterbacks coach Ben McDaniels pushes Tim Tebow during a passing drill. Tim Tebow and Brady Quinn look on during a minicamp workout in Denver. Tebow played just six games during his rookie season, mostly as a backup before starting the last three games of the Broncos' season. He threw for a total of 654 yards, five touchdowns and three interceptions. He also rushed for 227 yards and six touchdowns. Tim Tebow takes notes at a quarterbacks meeting with Broncos' head coach Josh McDaniels. After taking over as Broncos starter following the team's 1-4 start, Tim Tebow guided Denver to six straight victories to push their record to 8-5. Despite losing their last three regular season games, the Broncos won the AFC West and hosted a playoff game against the Steelers. 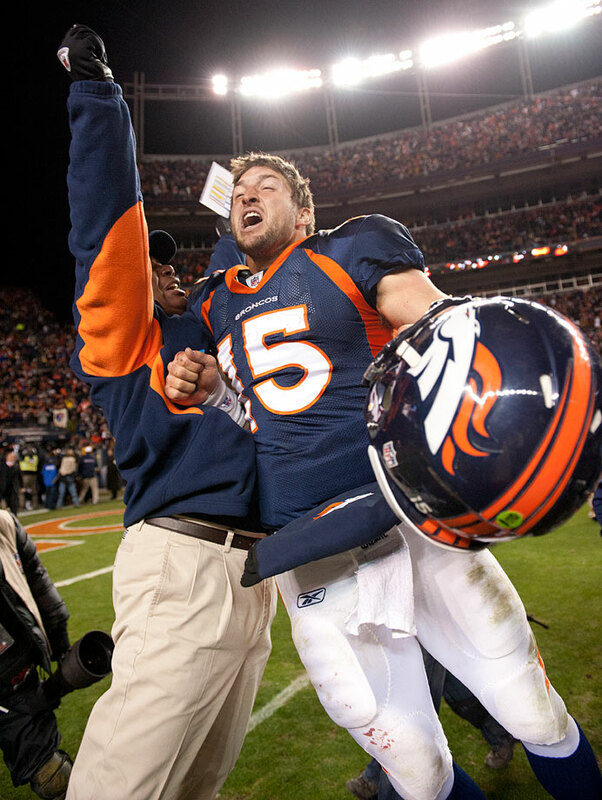 Tim Tebow became a hero in Denver when he led the Broncos to a 29-23 overtime playoff victory over the Steelers. Tebow threw for 316 yards, scored two touchdowns and ran for another. He won the game on a 80-yard touchdown pass to Demaryius Thomas on the first play of overtime. In what would turn out to be Tim Tebow's final game with the Broncos, the Patriots put his dream season to a nightmare end. In a 45-10 blowout loss, Tebow completed just 9 of 26 passes for 126 yards against a stifling Patriots defense. 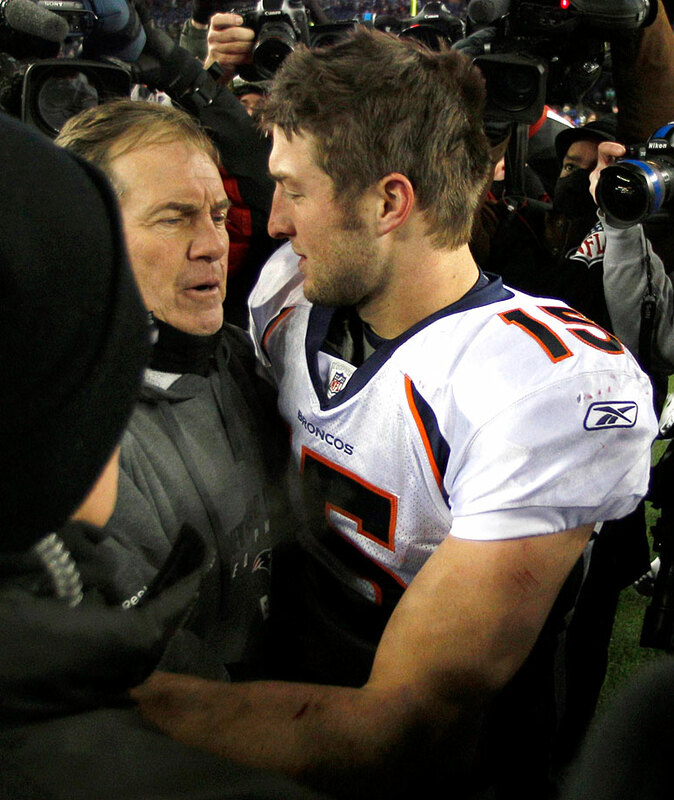 Tim Tebow hugs Pats head coach Bill Belichick following the Broncos divisional playoff loss. Despite his success in Denver, the Broncos signed future Hall of Famer Peyton Manning in March and traded Tim Tebow (along with Denver's 2012 seventh-round draft pick) to the Jets in exchange for New York's fourth and sixth round-picks. 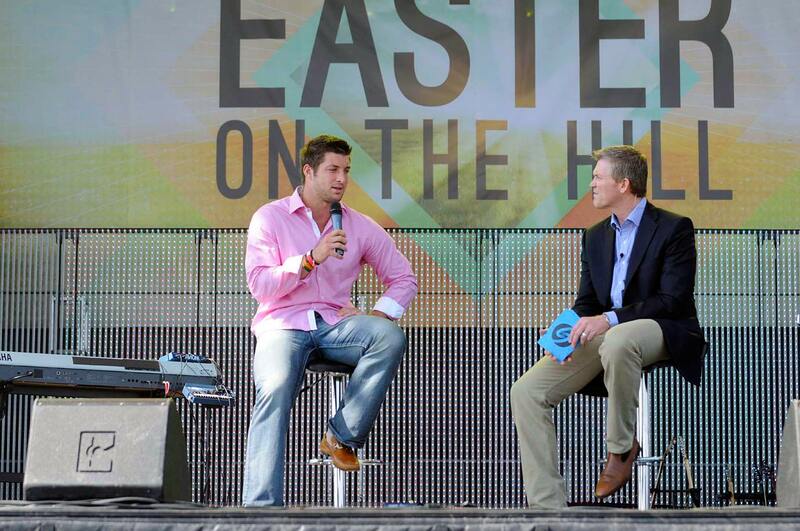 In April, a crowd of nearly 15,000 gathered at an outdoor Easter church service in Georgetown, Texas to hear Tim Tebow deliver a sermon at an outdoor service held by the Celebration Church. Tim Tebow and girlfriend Camilla Belle attend the "Schiaparelli And Prada: Impossible Conversations" Costume Institute Gala at the Metropolitan Museum of Art in New York City. Jeremy Lin, Jessica Biel and Tim Tebow attend the 2012 ESPY Awards at Nokia Theatre L.A. Live in Los Angeles. 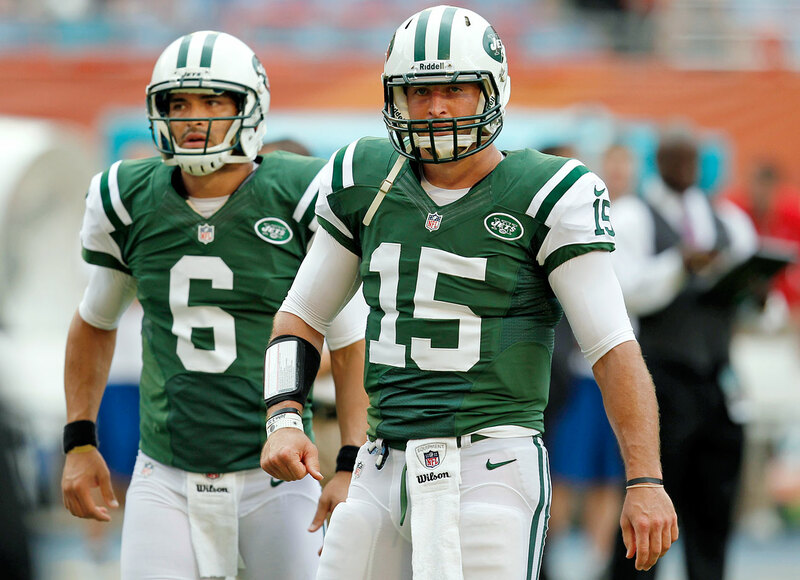 Tim Tebow spent the 2012 season with Mark Sanchez and the Jets, then was released, but signed with the Patriots in June 2013. 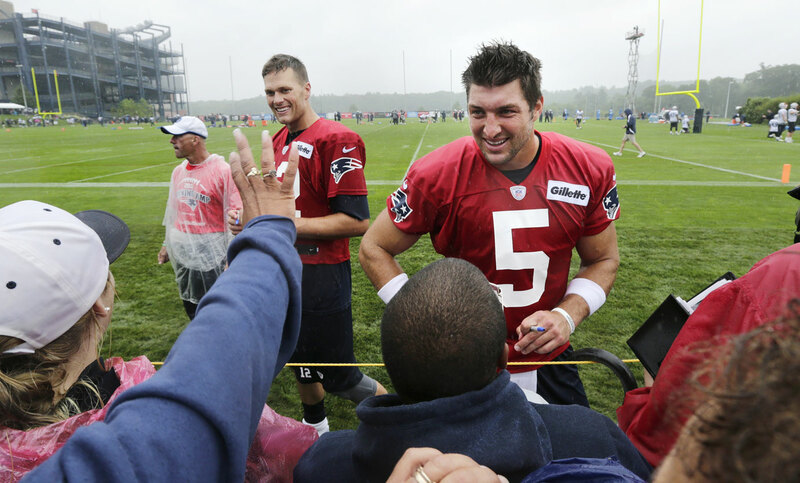 Patriots quarterbacks Tim Tebow and Tom Brady talk with fans and sign autographs following practice at training camp in Foxborough, Mass. The Pats released Tebow on Aug. 31. Tim Tebow ponders a question during an interview on the set of ESPN's new SEC Network in Charlotte, N.C. Tebow had a new job as a commentator for the SEC Network, but was still looking for work in the NFL as a quarterback. 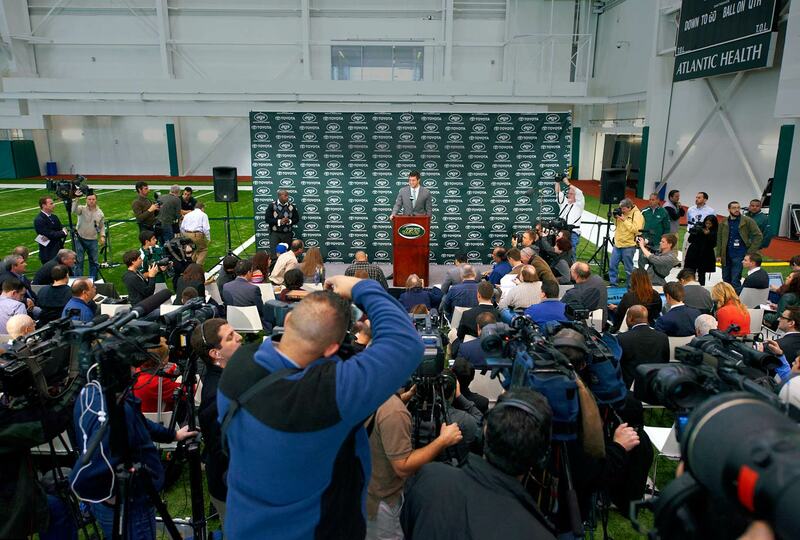 Tim Tebow speaks to the media after practice at Philadelphia Eagles training camp. Wildly popular and probably the most scrutinized player at camp, the biggest question is whether Chip Kelly finds enough ways to use Tebow to justify keeping him on the 53-man roster. Tim Tebow takes batting practice during a showcase for baseball scouts and the media at the USC campus in Los Angeles.